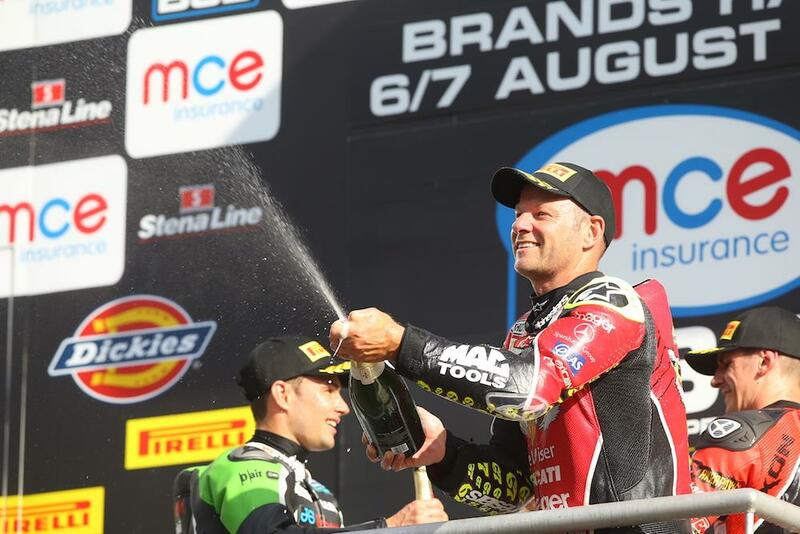 Shane 'Shakey' Byrne celebrated his first double win of the 2016 MCE Insurance British Superbike Championship at Brands Hatch, fending off a determined Leon Haslam to the rapturous reception of his home crowd. At the start Byrne made another disappointed start and was swallowed up into the pack and was running in ninth place as they hit Paddock Hill Bend for the first time with Jason O'Halloran and Honda Racing leading the field from Leon Haslam and Luke Mossey. Mossey was pushing hard to repeat his race one podium finish and on the second lap he moved ahead of Haslam at Paddock Hill Bend to move to within striking distance of the lead as James Ellison moved up to third to join the battle. Tommy Bridewell was again showing his fierce pace on the Bennetts Suzuki and he was battling in the lead group again until he was forced out of the race with a mechanical problem on the eighth lap. At the front O’Halloran was holding off Mossey and Glenn Irwin, who had forcefully moved through the pack to be third by the sixth lap and closing in on the pair ahead of him. The Be Wiser Ducati rider then pulled a move on Mossey to move second and he then came under fire from Haslam too. By lap eleven the battle for supremacy at the front had intensified and Byrne was up to fifth and then dived ahead of Mossey, but at the same time Haslam and Irwin was scrapping for second place with the pair trading places three times within four corners. Haslam held second though and then hit the front of the field as he struck again at Paddock Hill Bend, before O’Halloran reclaimed the place at Druids. As the fight at the front continued Michael Laverty suffered a technical problem with the Tyco BMW and that caused the Nissan GT-R Safety Car to be deployed. On the restart Haslam again hit the front with a move at Hawthorns to push O’Halloran back to second with Byrne on the pack in fourth. A lap later and championship leader Byrne, Haslam and O’Halloran were side-by-side as they crossed the line and the Be Wiser Ducati emerged at the front as the trio reached Druids. Byrne then held on for the final laps to claim the double win, holding off a hard-charging Haslam and O’Halloran – the top three in the championship standings after round seven. Irwin made amends for his race one crash by claiming fourth place ahead of Richard Cooper who moved back into the top six in the standings for Buildbase BMW, and Lee Jackson. Mossey crossed the line in seventh place with Dan Linfoot, James and Christian Iddon completing the top ten.